On this page I am sharing Free Printable Match the Baby Animal Game or Baby animal matching game in three different colors. The guests will have to match the name of the baby animal with the adult animal. This is a perfect game for any baby shower and especially for animal themed baby showers like Jungle, safari or zoo baby showers. All these game cards are decorated with images of cute animals made in watercolor. All these graphics that I have used in these games are original and made by me. Please do not steal or copy my games. How to Play: Print and distribute these game cards among the guests along with a pen or pencil. 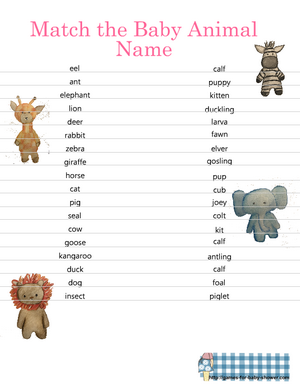 Ask the guests to match the name of the baby animal with the animal mother's name. They can match these names by connecting those through lines. You can check the answers given by the guests with the help of the answer key given at the end of this page. The person who manages to match most animals correctly will be the winner. You can also set the timer to 3 minutes or 5 minutes and allocate a time limit to the players for playing this game. This is the first free printable and very adorable game card that I have prepared. It has a title written in pink color and this game image is deocrated with a cute giraffe, a cuddly lion, a zebra and a super adorable elephant. This is a perfect game to be played on a girl baby shower. Just click on the thumbnail image and a bigger image will open up. You can save that image or print it right away. 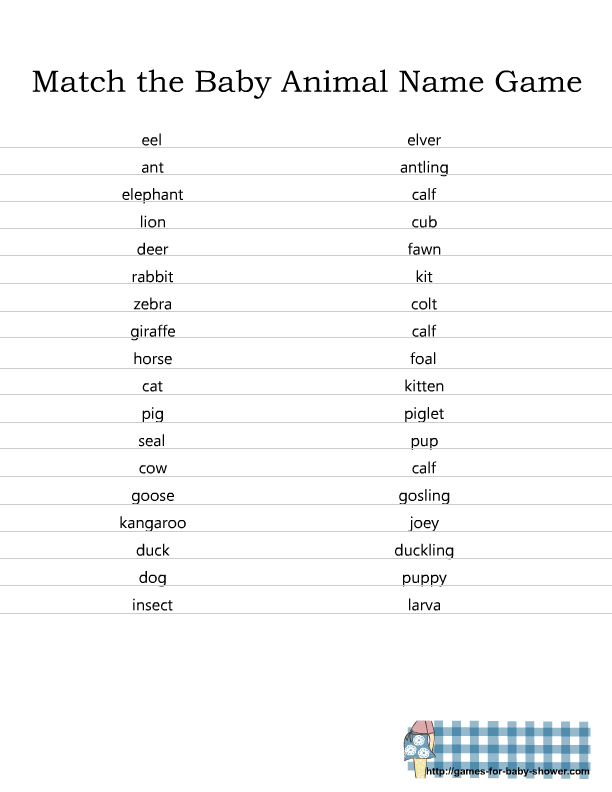 Click on the image given above to get the bigger version of this Blue baby animal matching game will open up. This Baby Animal Matching Game Printable is Free like all the printables on my website and this game card has a gender-neutral orange title. You can print this for your boy baby shower, girl baby shower or if the parents do not want to know or want to disclose the gender of the baby. 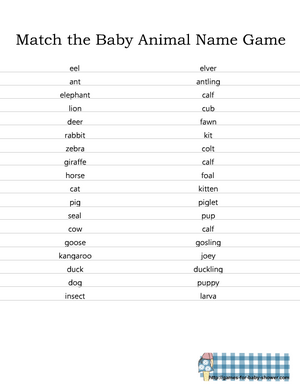 Here is the answer key to this match the baby animals name. You can check the answers given by the guests with the help of this solution.